ersol Solar and Bosch: Perfect together? What is the fate of ersol Thin Film? Way back on June 2, 2008, the Agreement between Ventizz and Bosch regarding sale of majority stake in ersol (Deutsch) or Bosch plans to acquire majority stake in ersol Solar Energy AG Activities in the photovoltaics field (Deutsch) announced the sale of Ventizz Capital Fund II LP, Wilmington, Delaware, USA, and its subsidiary Ventizz II Jersey Holding LP, Jersey, Channel Islands, 50.45% stake in ersol Solar Energy AG (FRA:ES6) to Robert Bosch GmbH, and Bosch’s plan to tender € 101.0 per share in cash for the outstanding shares. Please see this Financial Times article, “Bosch in €1.1bn solar power bid”, for the details. Chairman of the Supervisory Board of ersol AG and Management Board spokesman of Ventizz Capital Partners Advisory AG, which has acted as a consultant to the fund for this transaction. “Is Ersol Solar Worth $1.67B?” asks Rachel Barron at Greentech Media. learned that Bosch was not the only bidder for Ersol as several fortune 1000 companies have a longer term perspective of solar. Bosch valued Ersol’s vertical integration, secure polysilicon supply contracts, and contractual base for significant expansion. The Annual press conference and analyst conference presentation financial year results 2007 detailed ersol plans to expand silicon solar cell capacity from 180 MWp (MegaWatt-peak) in 2007 to 550MWp in 2012 fed by polysilicon sourced from Wacker Chemie AG, Hemlock Semiconductor Corporation, and the NITOL Group along with wafers from an unnamed Japanese manufacturer. In addition, I suspect Bosch preferred ersol’s approach of not entering the systems business in their coverage of the solar value chain. While Bosch hopes to extend its business in the area of renewable energies with the acquisition of ersol, I have to wonder if there is also a defensive aspect to this takeover. The Bosch Group is organized into three business sectors: Automotive Technology, Industrial Technology, and Consumer Goods and Building Technology. In 2007, Automotive Technology generated 61% or €28.4 billion of the Bosch Group’s €46.32 billion turnover. With Electric and Plug-in Hybrid Electric Vehicles (PHEV) dominating auto industry news amid record oil prices, photovoltaics are sure to be welcome as options to extend the range or power auxiliary systems on electric vehicles. In the near term, high efficiency, monocrystalline, silicon solar cells are best suited to maximize power generation from the limited area available on automobiles. Although the primary reason for the Bosch takeover may be diversification, there are synergies with their existing business sectors. For example, Sunways AG (FRA:SWW) partnered with Webasto Solar GmbH to produce solar sunroofs for cars using monocrystalline silicon solar cells. The solar sunroofs are used to power an interior car fan even when parked and is optional or standard equipment in select Audi, Lancia, Mercedes, and VW automobiles. Alas, Sunways may not have had the secured production scale to attract Bosch’s favor, and the Sunways inverter and MHH Solartechnik system businesses may not have been seen as complementary. And what of ersol Thin Film GmbH? I got a quick confirmation from ersol Investor Relations that the sale of the Ventizz stake includes their minority investment in ersol Thin Film per ersol paves the way for growth for its Thin Film unit. 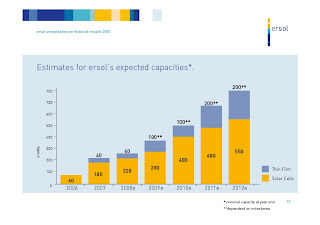 ersol Thin Film plans to increase production capacity to 100 MWp in 2009 and 200 MWp in 2011 depending on the successful joint development of micromorph tandem thin film production technology with SCHOTT Solar (please see ersol Thin Film and SCHOTT Solar forge alliance for the joint development of micromorphous thin-film technology). Ersol remains the leading Oerlikon customer in thin-film and believes it has solved big technical challenges and expects TUV certification in a few weeks on its 85 watt panels at ~6% efficiency, tandem structure is in development. The company anticipates thin film cost/watt to remain below that of polycrystalline offset by lower ASP. Material (TCO coated glass) remains the biggest cost component followed by depreciation and labor. The company can save on glass by coating in house. Capex ranges from Euro 2.0/watt for 6% efficiency to Euro 2.3 – 2.5/watt for 8 – 9% efficiency. Ersol believes that the price of its thin film panels can remain Euro 0.50 below that of crystalline’s cost curve long term thanks to scale, efficiency, throughput, and other cost saving factors. Despite the above limitations, ersol Thin Film signs module supply contract with Ralos Vertriebs GmbH (Deutsch) was the recent news of a 40 MWp supply contract for Nova-T modules delivered from 2008 to 2010 with Ralos Vertriebs GmbH. We believe pending Bosch acquisition of Ersol may signal beginning of industry consolidation. Perhaps this deal =is= a prelude to increased merger and acquisition activity in the photovoltaic space, but this deal does not result in significant photovoltaic consolidation just because Bosch has an existing investment matched by BASF Venture Capital GmbH in the organic thin film photovoltaics start-up, Heliatek GmbH, per German government and industry boost new technology, Using thin films to generate inexpensive solar power. In the ersol version of the Bosch deal press release (Deutsch), Dr. Claus Beneking, CEO of ersol Solar Energy AG, announced plans to retire from the Management Board of ersol AG for personal reasons in the next few months and just before ersol’s workforce passes the thousand mark (Deutsch). Dr. Beneking “will remain closely associated with the company and continue to be available for some years as a consultant.” This may have provided additional motivation for a takeover deal that Q-Cells AG or SolarWorld AG, for example, are too busy executing on 1 GWp (GigaWatt-peak) plus photovoltaic visions to even consider.